This article first appeared in Unlisted & Unlimited, The Edge Malaysia Weekly, on October 10 - 16, 2016. TRANSPORTING crude and refined petroleum products across rough seas is a dangerous business. The journey is perilous, the cargo highly flammable, and a huge investment is required upfront. On top of all that is the number of regulations imposed on the industry, usually in response to some disaster. It is a tough industry to contend with, one that is almost impossible for a newcomer to break into. That is probably why only three companies in the country are involved in the business — AET Tankers Sdn Bhd (a wholly-owned subsidiary of MISC Bhd), Halim Mazmin Bhd and Orkim Sdn Bhd. Orkim specialises in the shipping of clean petroleum products (CPP) and liquefied petroleum gas (LPG). It operates in Malaysia and is looking to do more business in Asean. “The oil and gas industry is divided into two segments — upstream, where you explore and produce oil, and downstream, where you refine and market your product. Orkim operates in the latter. 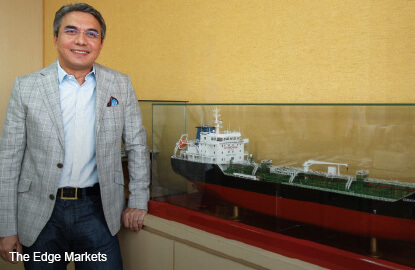 We are taxis moving petroleum products around on the sea,” says CEO Sharifuddin Al-Manaf. How does Orkim operate? An oil company charters its tankers and tells it where to pick up the product and where to send it. “We pick up products from Singapore, Port Dickson or Melaka and send them to distribution points in Peninsular Malaysia, Sabah and Sarawak,” says Sharifuddin. Orkim was established in 2004 as a shipbroker. Five years later, it went into the shipping business. In late 2014, national private equity firm Ekuiti Nasional Bhd (Ekuinas) invested in the company. Orkim currently has 16 vessels — 14 CPP tankers and two LPG tankers. The growth of its business has been consistent with that of the country’s gross domestic product (GDP), he says. So, transporting petroleum products from refineries to terminals remains a steady business. Orkim plans its schedule weekly and refines it daily. It also keeps in touch with the charterers on a regular basis to see if there are any problems that need to be addressed. “We have to ensure that our vessels are operational at all times — not only the vessels themselves but also the crew on board. We have to comply with the regulations and standards of both the charterers and maritime organisations,” says Sharifuddin, who has more than 20 years of experience in the oil and gas industry. Compliance with health, safety, security and environment (HSSE) standards has been very strong in the past few decades, he adds. If there are incidents such as spillage or hijacking, the relevant party is required to come up with suggestions on how to improve its processes. These suggestions lead to stricter standards and regulations. “We have to play along as the bar keeps rising. It means extra work and higher costs to comply with the new standards and regulations. It is a challenge for us to keep up with it,” says Sharifuddin. It is not that the regulations are impossible to comply with. It is just that they are unbelievably onerous. But it all boils down to educating the crew to abide by them while they are on board the tankers. It is a serious business indeed. Last year, two of the company’s CPP tankers — the Orkim Victory and the Orkim Harmony — were hijacked within a month of each other. Even though the petroleum product was siphoned off and the crew’s valuables were stolen, the authorities managed to recover the vessels and everyone escaped with their lives. Only one of the Orkim Harmony’s crew sustained injuries during the hijacking. During such incidents, the priority is to protect the lives on the vessel, says Sharifuddin. The company also needs to demonstrate to both its staff as well as the industry that it takes the incident seriously. “If the crew was intimidated by such an incident, no one would want to serve in this industry. Consequently, charter rates and salaries would go up, causing costs to rise,” he says. Another challenge for Orkim, says Sharifuddin, is to preserve revenue while reducing costs. The company needs to ensure that its vessels are well-managed and well-maintained so that the fleet can move at maximum capacity. This is to protect its profit margins. “We are only earn a fee when the vessels are moving around. Planned stops are accounted for in our profit and loss statement, so those are all right. But if the vessels make unplanned stops, we suffer a loss of income,” he explains. What kind of numbers are we talking about when it comes to investment? Sharifuddin says a single vessel costs between US$11 million and US$14 million, depending on the specifications and country of origin (Japan, South Korea or China). It also depends on the function of the vessel, whether it is to carry CPP or LPG. “Purchasing a new or pre-owned vessel is not as easy as buying a car. Sometimes, the vessels of a particular shipyard are already fully booked and the company will have to shop around for alternatives. The specifications of the vessels are not very different. It all depends on which shipyard is available to take your order,” he adds. Orkim has purchased both new and pre-owned vessels, depending on the needs of its clients. It bought three pre-owned vessels in November last year and they are currently operating at discounted prices. While some charterers insist on hiring new vessels, others just want to minimise operating costs. As this is a capital-intensive business, Sharifuddin says, the industry players need to enjoy economies of scale to run the show. This is the first entry barrier for newcomers. “It is not just about having vessels. You need to have operations and technical teams on board and a back office to support the team. You need maintenance. All these require intensive capital investment. It is not a business that anyone can simply come in and try out,” he points out. The second barrier to entry is the high expectations of the oil companies that charter these tankers as they only hire operators with a track record. “If you are not an established company, it will be very difficult for them to trust you with the highly flammable product. You have to be a reliable and competent service provider to get their contracts,” says Sharifuddin. It may sound a bit unforgiving but it is not necessarily bad, he says, as it is all about safety. If the newcomer carried the petroleum product and caused a leakage or fire, it would be a high cost for the industry to absorb. As Orkim owns 16 vessels and has two major clients in Shell and Petroliam Nasional Bhd, it is enjoying economies of scale. In the last financial year, the company’s audited accounts showed revenue of RM136.4 million and an earnings before interest, taxes, depreciation and amortisation (Ebitda) of RM75 million. “We definitely have higher targets this year. But in this depressed market, our vessels are not getting the contracts they deserve. Our revenue is currently slightly below target. Having said that, we will be more ready to take advantage of the upcoming charter rate in the second half of the year. We remain positive about meeting our targets,” says Sharifuddin. Does Orkim have any plans to go public? Not really. Sharifuddin points out that it sees listing as a fundraising tool and an exit strategy for investors, thus going public may not be its only option. “With Ekuinas coming into the equation in late 2014, we have purchased five vessels. We have sizeable assets, good cash flow and about RM600 million on our balance sheet. We have about 30% market share. We also have the ability to grow. An initial public offering is not our only option,” he says. Right now, Sharifuddin is concentrating on growing the business. The company is constantly on the lookout for new opportunities. More often than not, it depends on what is available in the market. “Sometimes, you want to buy but no one wants to sell. Sometimes, you want to serve but no one needs your service. We are always knocking on people’s doors hunting for contracts,” he laughs. To do this, Orkim is looking beyond Malaysia. Sharifuddin says it may replicate what it does in Malaysia, which is the shipping of CPP, over a longer route, such as from the Middle East to Singapore then to north China. It may explore some different segments in the region as well. “We have two LPG vessels with Nippon Gas Line Co Ltd in Japan, serving the South Korean and Japanese markets. The vessels are new. We took delivery of them in September last year and in February. Unfortunately, they came into the market when it was weak. So, these vessels are now on a short-term spot charter,” he says. He explains that a short-term charter is usually on a quarterly basis, which can be renewed, while a long-term charter is on yearly basis. As a subset of short-term charters, there is also the spot charter for a single voyage. These charters ensure that Orkim’s revenue stream remains steady over the contract period. “Industry players would want to have long-term charters. But at these depressed prices, why would you want to lock in a long-term contract? So, the operator just goes along to manage its cash flow. We would only look at locking in a long-term charter when the rate goes up,” says Sharifuddin. He adds that the company is exploring options with charterers in the region to see if the two LPG vessels could be moved here and play a strategic role in its growth plans. The regional opportunities would be more rewarding in the long run, he points out. “I think our current position is quite promising. Also, we have Ekuinas on board to help us financially if we need it to. Meanwhile, we are doing our best to grow the company. The future looks bright,” says Sharifuddin.